It takes way more paddling than we prepared for to catch Coach Laura Ricker and her teammates on any occasion once they hit the water. So, we decided to send an email instead. 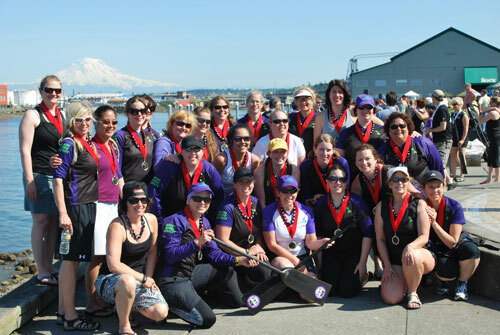 The Oregon Women Lawyers (OWLS) Dragonflies Dragon Boat Team are made up of more than 30 team members who, with their powers combined, practice just about every area of law. This year alone, they’ve secured 2nd place in the Rainier Dragon Boat Festival Women’s Division, and 3rd place in the PKSCA Rose Festival Dragon Boat Races, Women’s Division I. And believe me, they are just as relentless in the courtroom. See how these busy professionals use TeamSnap to make their transition from the office to the boat races a serious snap. The Dragonflies’ silver medals glisten in the sun with beautiful Mt Rainier looming in the distance at the 2012 Rainier Dragon Boat Festival. How does your Dragon boat team laugh in the face of fear and amp up before each race? Do you have any advice for effectively organizing practices, events, and snack assignments for sustaining warrior Dragon boat racing prowess? The Dragonflies have two captains every year that overlap by one year. The captains are integral for us in making TeamSnap work well with 30+ plays. The captains track availability for each practice and help to make sure we have answers for every Dragonfly whether they are attending practice or not. It is very important in our sport to manage attendance, since we require a minimum number at each practice and event – having access through the Android and iPhone apps is indispensable! TeamSnappers around the globe have reported catching wind of us through other teams and groups, and high-speed windmills. How did the OWLS Dragonflies first hear about us? We started using TeamSnap in late 2008/early 2009. We previously tracked our roster, contact information, attendance and payments through an elaborate system of spreadsheets, post-its and Yahoo groups emails. This was incredibly time consuming for the co-captains and inefficient, so the idea of a web-based team management tool was really appealing. Our co-captain at the time found an email from July 2008, asking if anyone had heard of TeamSnap, which was in beta at the time. She had read an article that mentioned it somewhere, and like that TeamSnap was both based in Portland and specifically listed dragon boating as a sport! It looks like it took us the rest of 2008 to decide to use it, set it up for traction (initially, the co-captains were filling in roster and attendance information), but now it’s indispensable. Added functionality in tracking payments and the iPhone app have solidified that.